Avenging the Fantastic, Part 3: Captain America Returns! Tales of Suspense (starring Iron Man) #45-49; Tales to Astonish (starring Ant-Man) #47-51; Strange Tales (starring the Human Torch) #113-119; Fantastic Four #19-24; Journey Into Mystery (starring Thor) #97-104; Avengers #2-4; years spanned: 1963-4. Iron Man finally gets a supporting cast in Tales of Suspense #45, where we meet Pepper Potts and Happy Hogan (Gwyneth Paltrow and Jon Favreau in the movies). He ditches his clunky original armor for a more recognizable design in TOS #48. Ant-Man becomes Giant-Man in Tales to Astonish #49. The X-Men were introduced in their own series, which we’re not covering here, but they make their first guest appearance when they meet Iron Man in TOS #49. Though he first appeared in the World War II–era Sgt. Fury and His Howling Commandos, Nick Fury makes his first modern-day appearance in Fantastic Four #21, where we learn he now works for the CIA. The Lady Sif first appears in a flashback story of Thor’s youth in Journey Into Mystery #102, although she’s nothing more than a damsel in distress with zero lines of dialogue. Sif the warrior, like we see in the movies, is yet to come. The Invisible Girl gains a more useful power—invisible force fields—in FF #22, and unless I missed it earlier, the Thing first utters his famous catchphrase, “It’s clobberin’ time!” in FF #23. The intended target of clobberin’ is Dr. Doom, and the Thing, still relatively inexperienced at clobberin’, swings and misses. Captain America joins the modern world in Avengers #4. However, earlier, the character had a “tryout” in Strange Tales #114, though that was a villain in disguise messing with the Human Torch (an gauging reader interest in the dormant World War II character). Notable new villains include Rama Tut in FF #19, the Crimson Dynamo in TOS #46, the Molecule Man in FF #20, the Human Top (later Whirlwind) in TTA #50, Mr. Hyde (who Kyle Maclachlan plays in Agents of SHIELD) in JIM #99, and the Enchantress, the first recurring female villain, in JIM #103. In Avengers #4, we learn that Bucky Barnes, Captain America’s teen sidekick, apparently did not survive World War II. This entry was posted in Avenging the Fantastic, comic books on June 25, 2015 by drsherrier. Avenging the Fantastic, Part 2: Avengers Assemble! Tales to Astonish (starring Ant-Man) #42-46; Tales of Suspense (starring Iron Man) #40-44; Journey Into Mystery (starring Thor) #92-96; Fantastic Four #14-18, Annual #1; Strange Tales (starring the Human Torch) #109-112, Annual #2; Avengers #1; year: 1963. We meet Janet Van Dyne, a.k.a. the Wasp, who becomes Ant-Man’s sidekick in TTA #44. This brings us up to two female superheroes in the Marvel Comics Universe—one who turns invisible and one who shrinks. Unless I missed someone, we also get the first non-white, non-extraterrestrial super-villain who would recur, the Radioactive Man, in JIM #93 (though back then they hyphenated it as “Radio-Active”). He comes from Red China, of course. The Fantastic Four battle the Mad Thinker and his Awesome Android for the first time in FF #15, and in the next issue they take the first trip to the Microverse. In #18, the shape-shifting alien Skrulls introduce their Super-Skrull. The Human Torch endures his first team-up with Spider-Man in Strange Tales Annual #2 (though they first met in the first issue of Spider-Man’s series, which we’re not covering here). 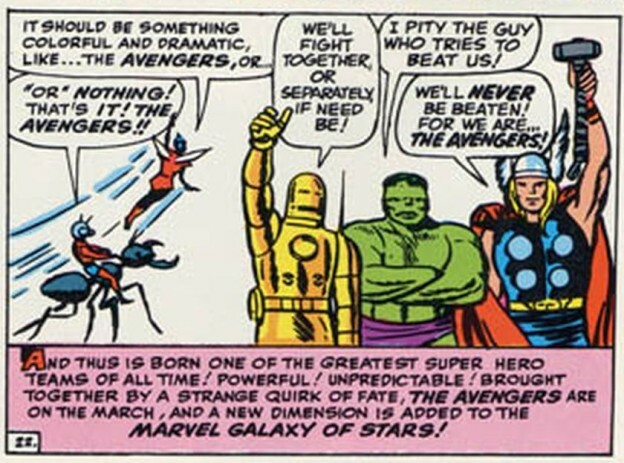 And the Avengers assemble in their own first issue, with the initial line-up of Iron Man, Thor, Hulk, Ant-Man, and the Wasp. –So, back in the day, Ant-Man had a somewhat reckless method of travel. At the size of an insect, he catapults himself out his window and across the city. While he’s being a projectile, ants converge at the landing spot he calculated, and they act as a cushion for him to fall on. He gives the Wasp wings so she can fly, but Ant-Man, the little reckless daredevil, keeps catapulting himself and never thinks to give himself wings. Though in TTA #46, he does start riding flying ants “like a Pegasus.” The man travels in style. –Iron Man’s armor is powered by “transistors,” not “ark reactor” technology as seen in the movies and modern comics. And as Tony Stark, he doesn’t just have the glowing circle in his chest—he has to wear an entire armored chestplate under his clothes at all times. To recharge, he literally plugs the armor into everyday electrical sockets, the same ones you would use to plug in a toaster, and he sits there and waits. Tales of suspense, indeed. This entry was posted in Avenging the Fantastic, comic books on June 11, 2015 by drsherrier.